Although it seems a very basic theme in illustration, the color palette is something that often gives me headaches. Everything seems much easier in black and white and when I have to choose a palette for a project I end up using the most basic colors, the pigments that I already have in my watercolor case. I want to go further than these colors. So I put together three little notes that I want to remember whenever I start a new project. To work on this problem I have decided to make me a Color “Cheat Sheet”. I chose the main pigments that I have in tablet and tube, in this case they were 14. I designed a table (14 rows and 14 columns) and painted the result of all those pigments mixed together, varying the quantity of each pigment every time the combination was repeated. 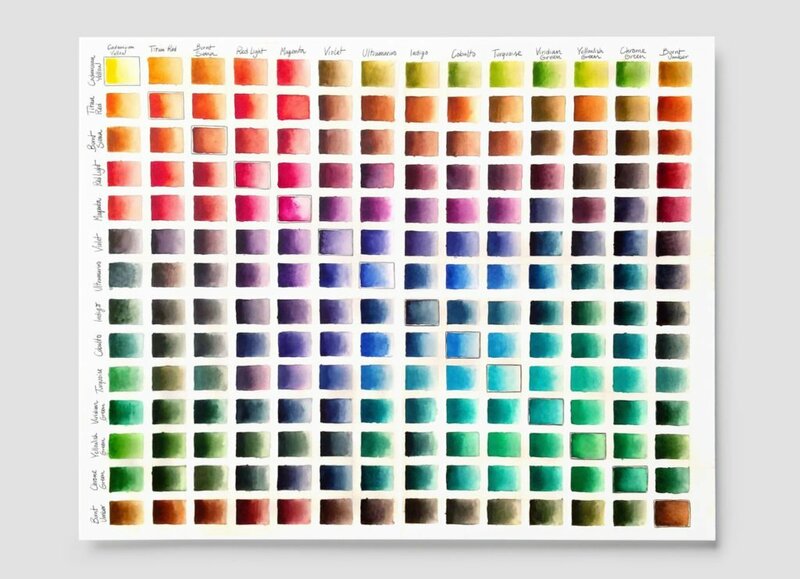 Now, every time I have to choose a color palette, I look at this cheat sheet, not to directly choose one of them, but it serves as a guide to know what kind of mixture I would use to find a certain color, and which ones better match each other. It is important to look for and discover other colors beyond those that we have purchased. Mix and look for different nuances, a palette of your own that makes the illustration much more personal and rich. 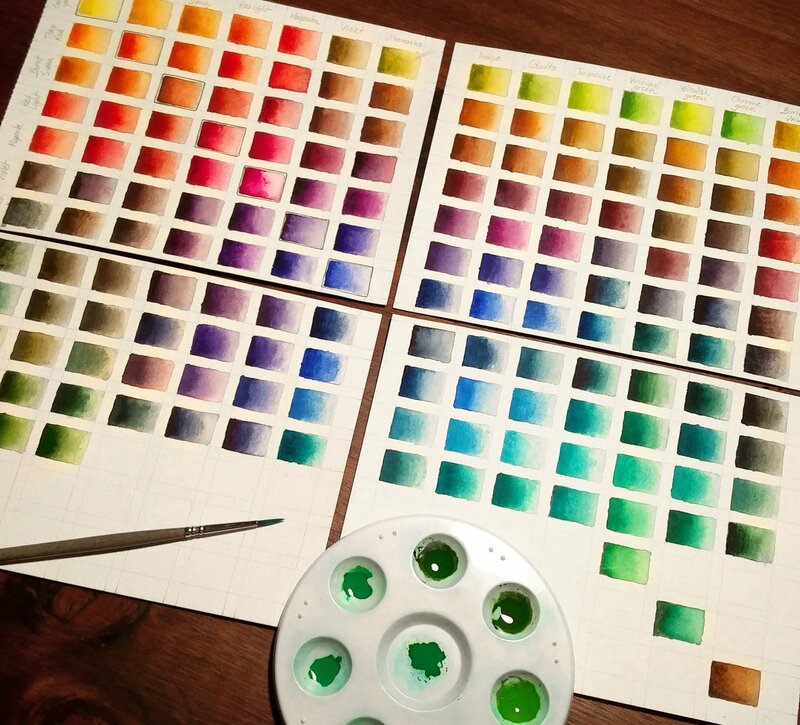 As we paint, we discover that there are certain colors that we like more, certain palettes that we are repeating, and that later will help us to define our own artistic style (which I still have a lot to work on!). There are mistakes that I often make: paint the sky blue, the grass green, the strawberries red … but not always the sky is blue, neither the grass is green, nor the strawberries are red. Before painting the kiwi with plain green, the tangerine with orange and the blueberries with violet (illustration on the left) we can perhaps explore the colors a bit to give them, for example, an emotion, a temperature, an environment … (illustration on the right, everything is wrapped in a red light). The elements thus gain a common context. Another mistake that I make more times than I would like is to use too many colors in the same illustration. There are illustrations with many colors and that itself is not an error when it is justified. But when I want to create a certain atmosphere or cohesion between the elements of an illustration (or several): less is more (that phrase we have already heard a thousand times but is not always correct, in this case I think it is). In the children book “El Cuenco de Viri”, apart from one or another detail, all 12 illustrations are based on the same palette of 4 colors. The color palette is a subject of which there is a lot to talk about. I hope that these three notes will help you as much as they will help me. Because these things have to be repeated again and again until they come out in a more intuitive way.